The search for balance is fundamental in my work. Each piece starts with the notions of risk juxtaposed with calculated marks. Broad, spontaneous color fields are confronted with deliberate and intricate markings. A visual order is constantly shifting, as I invite in the arbitrary yet stay conscious of its counterpart. Using the thickness of acrylics along with the fluidity of the ink create yet another visual paradox played out in these color fields, as marks obscure the traces of layers that are revealed and interwind through the surface. This process mirrors how we find balance between complementary yet opposing aspects of our nature; how deliberate are we in what we invite in versus what is allowed to unfold? The end result reveals a complex, yet intuitive symmetry, where the unexpected and the intentional coexist in a delicate balance. 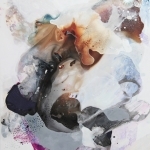 Lina Alattar received her Bachelor of Fine Arts from MTSU where she studied painting and graphic design. 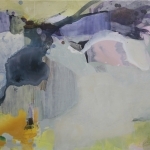 She continued her education in Gubio, Italy through an Art Study Program, where she trained with painters who encouraged an experimental and process-based approach to painting. Upon returning to the United States, Lina pursued an independent painting program at GW, where she also worked as a Creative Art Director. Working predominately with ink and acrylic paint, Lina’s work explores the value of chance and impermanence in the creative process. She finds that her improvisational freedom is both liberating and grounding at both ends of the spectrum. Her work mimics notions of the unexpected and the intentional, coexisting in a delicate balance. Lina is the recipient of the 2016 Art Bank grant from the DC Commission on the Arts and Humanities. 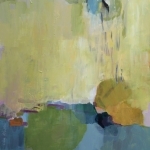 Her recent solo exhibitions include Hillyer Art Space, Touchstone Gallery and Capital One. 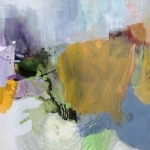 Recent group exhibitions include the United States Institute of Peace, Greater Reston Arts Center, McLean Projects for the Arts, George Mason University, Walter E. Washington Convention Center, and Caravan in London and NYC. Lina has also served as a Vice President of the Board for Touchstone Gallery from 2015-2016. She lives and works in Fairfax, VA.